An English 'landscape gardener'. Edward Milner was apprenticed to Joseph Paxton to work in the garden at Chatsworth. He then became superintendent of the Prince's Park Liverpool and then of what is now the Crystal Palace Park in Sydenham. Milner then became an independent garden and park designer, working at Buxton, Lincoln, Bodnant and Gisselfeld in Denmark. 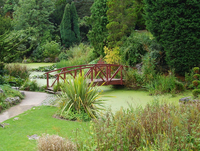 Edward Milner founded the firm of Milner-White which survived until the retirement of Frank Marshall in 1995, at which time it was the oldest garden design and landscape architecture practice in the British Isles.